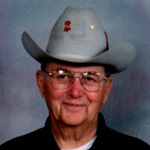 Quintin Clarence Sulzle, 86, was called to his heavenly home on Tuesday, July 26, 2016. Quintin was born to George and Elsie Martha (Siewert) Sulzle on January 12, 1930 on a farm near Akaska, S.D. He became a child of God through baptism on February 16, 1930 at Zion Lutheran Church in Akaska. Quintin was confirmed in the Lutheran Faith in May 1943.